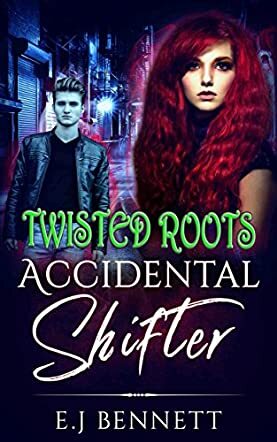 Accidental Shifter: Twisted Roots by EJ Bennett features Jenna, a normal teen, who sneaks out to attend a party one night while her parents are out. On her way home, she is grabbed by a man and must escape into a lab that is run by her father. Once inside, she throws chemicals on her attacker and believes that she has killed him. She heads back home with her guilty secret. Jenna seems like a typical teen, interested in parties and boys. She feels guilty about her actions at the lab, but she was only protecting herself. She doesn't get out of the encounter unscathed, as she soon discovers. I liked that the story jumped straight into the action and it moved at a good pace. It's not very long, overall, so it was important that it did keep up the pace. I thought at times that some of the sentences jarred slightly, wherein words were not quite used correctly. The dialogue occasionally sounded overly polite in places. However, I think Accidental Shifter: Twisted Roots will appeal to young adult readers and that Jenna is a well rounded character. EJ Bennett has created a good fantasy world with Accidental Shifter: Twisted Roots. I think it has a lot of potential and there are plenty more stories to tell in this world. I do love supernatural tales like this and it is interesting reading something a little different to the usual shifter stories that are available. A good start to the series.